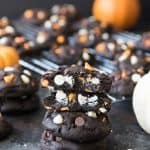 Everybody loves these Dark Chocolate Halloween Chip Cookies and they are such easy Halloween cookies to make! Guys, October is seriously my favorite. The weather is perfect, fall is in the air, there are pumpkin patches and apple cider and hayrides, my birthday is halfway through the month, and Halloween is at the end of the month. And I LOVE Halloween. 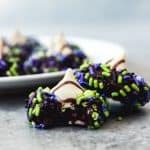 I have been holding off watching Hocus Pocus (the BEST Halloween movie) or posting Halloween recipes even though I have been itching to do both. But now that October is finally here, I’m so excited to share these dark & white chocolate peanut butter chip cookies with you! 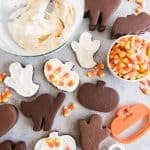 These cookies are perfect for a Halloween party, especially if you like sticking with the orange, black and white color scheme. If you are looking for more easy, Halloween treats with the same color scheme, you have to check out my Halloween Chex Mix Muddy Buddies that include candy corn & pretzels! 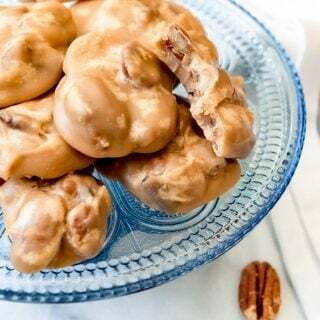 And these cookies don’t require any fussy decorating skills (which I totally lack), so they are an easy everyday cookie and you can make them all month long if you want (which you will once you try them!). The only extra step I take that I wouldn’t normally do with a cookie recipe is I keep a few of the white & orange chocolate chips in reserve and press them into the cookies on top right as soon as they come out of the oven in order to give them a prettier look by showing off the orange & white colors. I do the same thing when I am making M&M cookies or other cookies with mix-ins whenever I really want to show off what’s inside. To make these cookies, I used Hershey’s Special Dark cocoa powder instead of regular unsweetened cocoa powder. It makes the cookie dough almost black, it is so dark, which is perfect for Halloween! But if you only have regular cocoa powder, you could just use that and they would still turn out delicious. The chips I used are the holiday baking chips that Nestle makes for both Halloween and Christmas. I love, love, love them because they are so cute and make baking seasonal goodies super easy for someone like me who doesn’t fuss too much with fancy piping or other decorating techniques. The Halloween chips are a blend of semisweet chocolate chips and orange colored white chocolate chips and I always make sure to grab a couple of bags from the seasonal aisle in Target whenever they show up each year. They are also fun to use in place of regular chocolate chips in my soft & chewy chocolate chip cookies recipe. But they are amazing nestled into this dark chocolate cookie dough. Since the Halloween chips only come in black (well, chocolate, so dark brown I guess) & orange, I decided to combine them with some regular white chocolate chips for a pop of ghostly color and peanut butter chips and mini Reese’s Pieces for just a hint of peanut butter flavor. This recipe doesn’t use the whole bag of white chocolate chips, but you can use up any extras in these White Chocolate Macadamia Nut Cookies, which are another favorite of mine. If you don’t want the peanut butter flavor or have allergies, just leave them out and only do the white chocolate chips instead! I found all of these chips in the seasonal baking aisle at Target, although if you have a hard time tracking down the mini Reese’s Pieces you could always use the regular size ones. 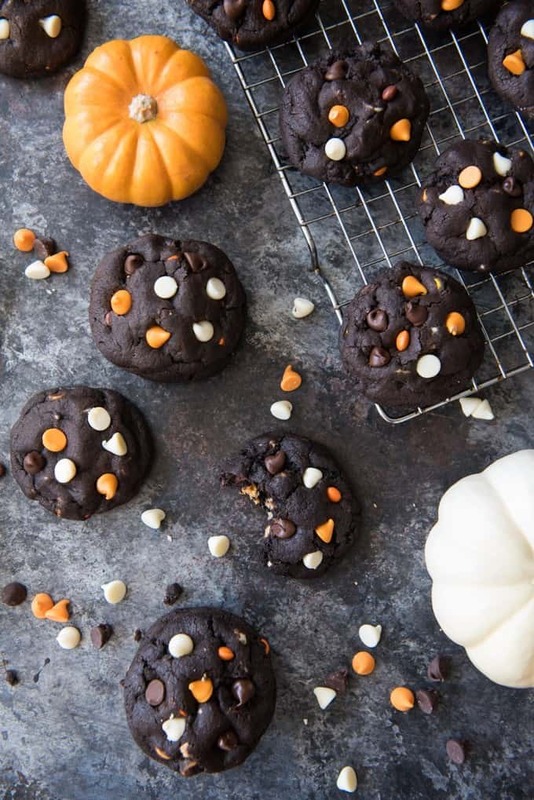 These dark chocolate Halloween chip cookies are sure to put a smile on your Trick-or-Treater’s face! Okay, I love these cookies so much! I’m all about festive baking and holiday themed food. 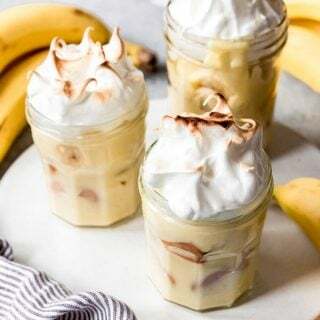 I’m totally making these, maybe today LOL! Hi Mahrlee! I wish I knew! I have been looking too because I always grab a few bags as soon as I see them, but I think it’s really more like the last week of September that they are in stores. I did a quick search online just now and they aren’t available on Amazon or Target yet either, so I think Nestle just hasn’t released them this year yet. 🙂 Soon though! Oh no!! That’s such sad news!! I guess I will have to start looking for and experimenting with an orange substitute! My initial though would at least be to use white chocolate chips and maybe pick through only the orange Reese’s or orange M&M’s or something although really, the orange in the Nestle’s morsels were just colored white chocolate chips. I tried these with the pumpkin spice chips tonight, which are the best replacement as far as that bright pop of orange goes. But while the chips taste okay, I’m personally not much of a fan of pumpkin spice flavored things. The chocolate and peanut butter chips and reese’s are still the dominant flavor, so it’s not a terrible replacement, but to keep the flavor profile the same, I am going to stick with using additional peanut butter chips and orange reese’s for the pop of orange. I’m also planning on trying to make my own orange white chocolate chips and see how that goes. Wish I had a better answer! Instead of using the triple chips, I did 1 cup white chocolate chips, 1/2 cup semi sweet chocolate chips, 1/2 cup peanut butter cups, and 1/2 cup just orange regular sized Reese’s pieces, like you suggested. It actually turned out AMAZING and has that orange pop. Yas! Yay! I’m so glad that combo works so well! Awesome! Yes, I think that seems to be what is working best for everyone! Thanks for sharing! Fantastic! These cookies are gorgeous! I’ll take a dozen! 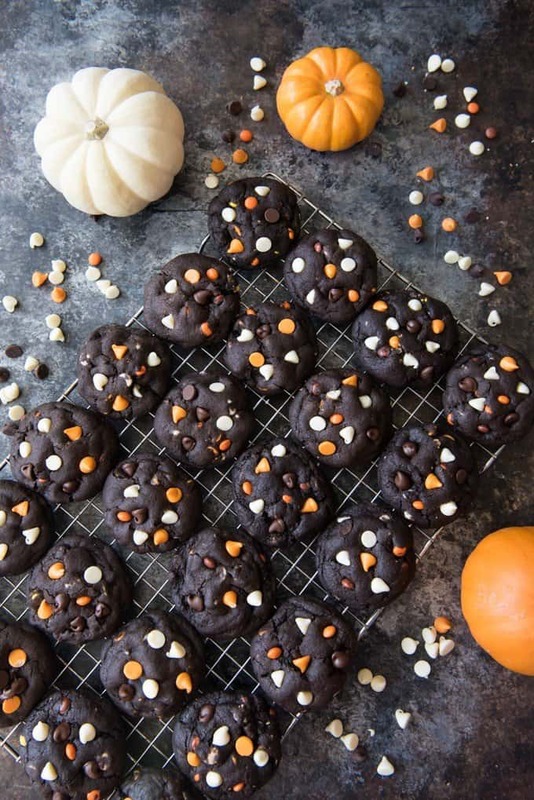 These look delicious and October is also one of my favorites – I love pum[pkin everything and Hocus Pocus is one of my favorites too though I haven’t seen it in years! Netflix!! I die every time I watch it! These look so fun and Halloween-y! I love using dark cocoa for creepy treats. Did somebody say, “dark chocolate and peanut butter?! !” I’m drooling over here. Your cookies look gorgeous! 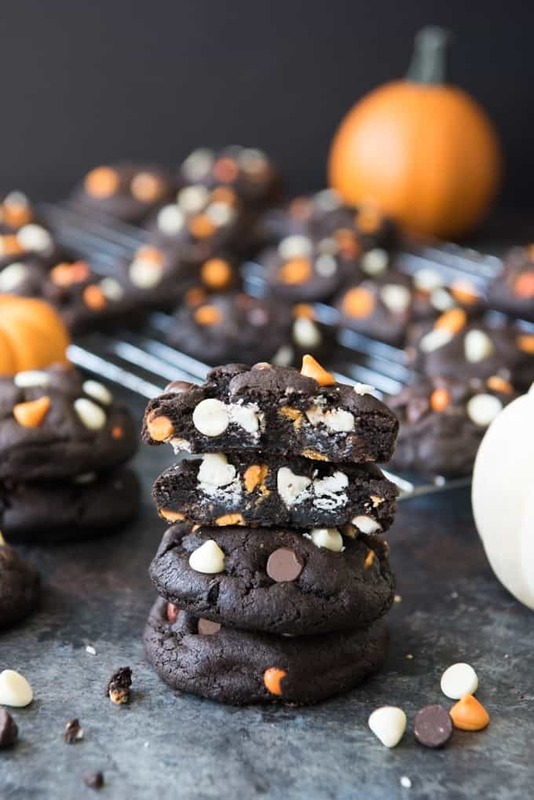 These deep, dark cookies make for a tempting treat on a halloween-y night! Love them. These look amazing! I can’t wait to try them! About how many cookies should this recipe make? Thanks, Erin! So fun to meet another lawyer/food blogger! Lol – thanks, Heather! I feel the same way about these cookies! Self-restraint is such a problem! Great cookies! I just made them, the batter Is amazing on its own. Very rich chocolate taste, I love them !! So glad you liked them Jenni! We love them too, and yes, the dark chocolate cookie dough base is such good stuff and sooo chocolatey! I just made these for our BYU football game treat – they were a huge hit for our family and friends! Everybody loved them! I made them a little smaller than suggested (1 Tbs. each) and we came out with 48 cookies after we indulged in the batter a little bit. They were the perfect size for all the kids who were here with us. I’m a huge sucker for a soft and chewy cookie, and these were perfect in that regard. And the dark chocolate/peanut butter combo – SO DELICIOUS! Thanks for a great recipe! Hey Amy – we have our company’s “Halloween Potluck” tomorrow and I was looking for a good, but easy Halloween dessert recipe to make. 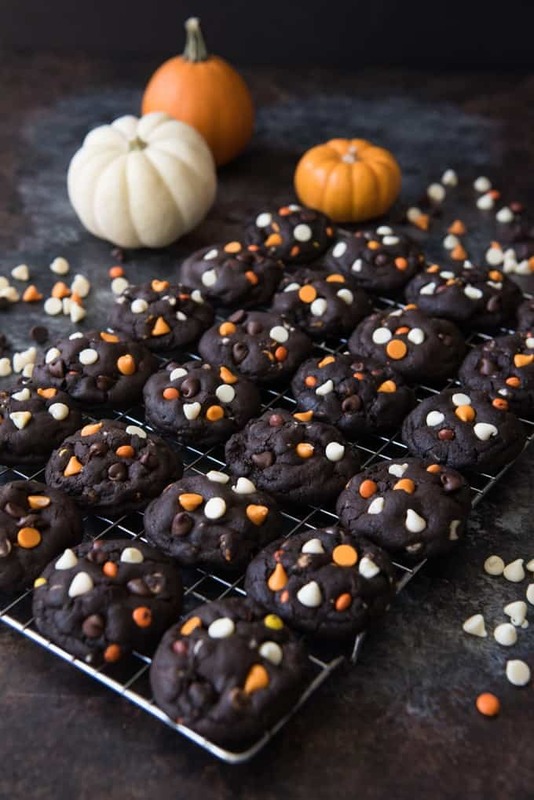 I decided to make your fabulous Chocolate Halloween Chip Cookies and OH MAN are they delish!!! I had to tell my 7 year old to stop eating them….HUGE winner at our house tonight! I can’t wait to take these festive cookies into the potluck tomorrow! 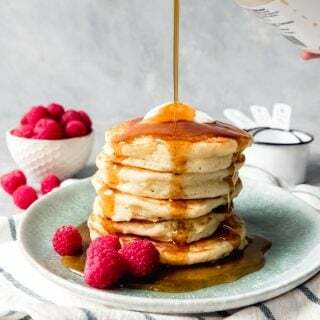 Thanks for posting a fabulous recipe! That’s awesome! I’m so glad you guys like them as much as we do! You are very welcome! Going to make these to take to a Halloween party tomorrow night. They look delicious and so festive. 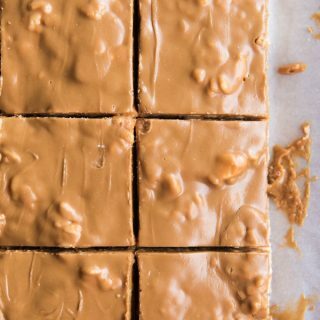 Dark chocolate and peanut butter, yes please!! How fun! Halloween parties are my favorite! These cookies were good, so sweet and indulgent. I live in Canada and can’t get the Halloween chips or Hershey’s dark cocoa, so I used extra Reese’s minis/dark chocolate chips and the dark red cocoa powder from bulk barn. (Just a reference for other Canadians that want to make this!) For topping the cookies I used the orange Reese’s pieces, dark chocolate chips and white chocolate chips. Also my batter was really soft, I had to refrigerate the dough for about an hour before it was workable. These would be great cookies for ice cream sandwiches because they are so soft. So glad you liked them Zara! I really appreciate the helpful tips for anyone who doesn’t have access to the Nestle’s Halloween chips! And I will make a note in case anyone else finds they need to refrigerate the dough before forming it into balls. Hey Zara, did they turn out dark like the ones in the picture? I also live in Canada and can’t find the cocoa anywhere. I am making these tomorrow for my son’s school Halloween Carnival. I am thinking of adding candy/baking eyes to the top as well to make them look more goolish:) can’t wait to find out how they will look. I love that idea, Pam! If you do, I would love it if you would tag me on IG at houseofnasheats! I’m sure that will be so cute! These cookies are amazing! Even my husband who isn’t a big fan of chocolate, and is especially not a fan at all of dark chocolate, can’t put them down!! I’m so glad you and your husband like them, Tina! I come from the lawyer world as well ? These cookies look AMAZING! 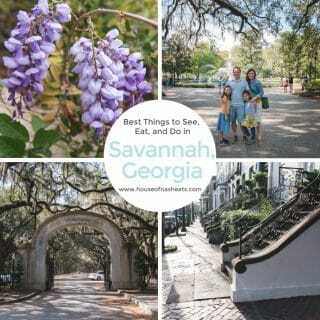 Love the blog ? 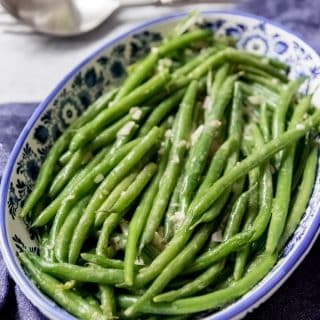 I just found this recipe! They look so delicious! We have 2, 6’2″ 200+lb, 15 yr old grandsons who play basketball and football!!! I will have to triple this recipe so there’ll be a few left for us!!! Lol and my favorite Halloween movie is Practical Magic starring Sandra Bullock. Would love to live in that house!!!! Thank you for another great recipe! I don’t think I have ever seen Practical Magic! I’m going to have to watch it this year! Just made these as I couldn’t wait for Halloween. Great recipe, beautiful cookies. And definitely watch Practical Magic – it’s absurd but it’s fun, and it’s on Netflix! good cookie recipe, my only problem which is a good problem it made 50 cookie per batch. long story short since it only made 24 cookies I though I would times the recipe by 4.. but in stead of it making 96 cookies it made 200 cookies. so now I have a ton of cookies to eat and to make my friends fat with, I’m not complaining though. Lol – maybe I need to be more specific that I have a tendency to make really large cookies! My 2 dozen is someone else’s 4 dozen, apparently! Glad you like them! Not a silly question at all! No, I would not use this recipe with cookie cutters. The dough won’t be firm enough and wouldn’t hold it’s shape very well. However, I have a chocolate sugar cookie recipe coming your way next week that will be perfect (and is so, so yummy!). Check back next week! Also just one more question, how many cookies is it for the nutritional facts? is it just one? Yes, it is one cookie for the nutritional facts, but keep in mind that I make really large cookies (only 24 for the entire batch) so they are bigger than average. I can’t find the cocoa powder anywhere! What can I use instead of the Hershey’s special dark cocoa powder and still make the cookies look dark and black?! I live in Canada and went to a store and they were selling Black Cocoa Powder 10/12% is this okay to use? I’m new at baking. This is a great question and I’m going to have to experiment some and update the post for other readers facing the same dilemma! For now, I would try ordering it online, or try a dutch processed cocoa powder, which, I think, is essentially what Hershey’s Special Dark Cocoa Powder is. 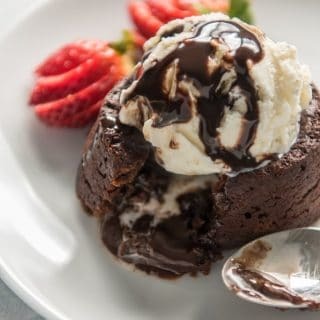 The other option I can think of would be to use regular cocoa powder and add black coloring to your cookies – either with black gel food coloring or I have heard awesome things about cooking with a product called activated charcoal that turns things super black without affecting flavor. I haven’t tried the activated charcoal but it’s on my list of kitchen goodies to experiment with! My daughter and I made these this week and they’re amazing!!! I used extra peanut butter chips instead of the halloween chips. They didn’t look as pretties yours, but wow, they tasted good! (I did not reserve extra to make them pretty at the end. I’m pregnant and due any day, so I was much more concerned with taste than presentation, haha). I keep thinking of other variations, like mint pieces, or crushed candy canes for winter to make them like hot chocolate cookies. Or, you could add coconut for an Almond Joy taste. So many options! The base of the cookie is moist, chewy, and not super sweet. Thanks for the recipe- it’s amazing!!! So glad you liked them! Nothing wrong with extra peanut butter chips, lol! I love your idea of turning these into an Almond Joy cookie and am totally going to play around with that! And yes, so good with mint chips! Happy baking! For orange chips I can only find Nestle pumpkin spice chips. Do you think this would have a big impact on the flavor? Am I better off just using extra orange mini reeses pieces? Thanks. Hey Julie – yeah, from what I understand, Nestle discontinued their Halloween chips this year! I’m so bummed! 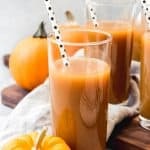 I need to update the post with some alternatives, but other readers have mentioned using the pumpkin spice chips and enjoying the cookies just as well, even though it does have some impact on flavor. But not a ton, so they are a pretty good option. Other options are more reese’s or to make your own orange colored chips using melted white chocolate and orange food coloring. I’m thinking of trying this method, which is easier than it sounds. 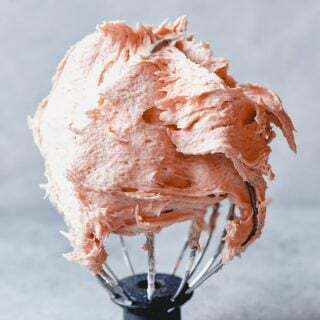 I used it when I made rainbow chip frosting, which you can find here: https://houseofnasheats.com/homemade-rainbow-chip-frosting-recipe/. Amy, have a Halloween party tomorrow night and want to make these. Have you ever made cookie bars from this recipe? Thanks! I haven’t but I think they would turn out great and probably look super cute! If you do it, I would love to see a picture! These were fantastic! I have made them twice now, and they were gone in a wink of an eye. They were so soft, and flavorful. I had a really hard time finding Reese’s mini chips, and think they may be phasing them out. Still, incredibly yummy!! Thanks so much, Abby! I’m glad you loved them! I really hope Reese’s doesn’t phase them out! I love those chips! These cookies turned out perfect! I used butterscotch chips, semi sweet chips, white chocolate chips and orange m&ms for half and added Reece’s pieces in the other half . I worry about peanut butter allergies. I chilled the dough for 20 minutes too. They were a huge delicious hit at our Halloween get together. Thank you !!!!! I’m glad they were a hit! We have some peanut allergies in the family too (my nieces).